Proper Cognitive Accessible Designs, Usability, and UX Designs will become the most important functionality of Tech, Web Sites, Product Information, and Store Shelve Displays in the 21st Century. Knowledge will be KING! Does your Product’s Usability meet Mass Consumption? This blog was originally written as part of a discussion I shared on LinkedIn.com. I shared it here on my blog in Nov. 2013 – and thought to provide an update March 20, 2017. So much is happening in the field of tech, web site, and product “usability” that I cannot begin to cover here. But I will share some recent frustrating tech challenges that raise both “usability” and “cognitive accessibility.” I really think we’ve crossed a threshold today, where going forward, the two will forever be intertwined. So if you didn’t understand cognitive accessibility and special needs designs before, you’re really going to feel lost now. In a nutshell, about 40% of tech users and consumers have some level of cognitive challenge today, albeit thru a learning disability, neurological disorder, brain injury or concussion, drug & alcohol addiction problems, migraine disorders, or are simply aging. Baby-boomers may be the largest growing segment of the cognitive special needs population today, ranging in age from their early 50s to late 70s. This translates to increased attention and functionality on usability, UX design, and human factors understanding in everything from product design to user instructions, to site/app accessibility, to product packaging and displays on store shelves. It also transcends challenges posed by visual impairment and mobility. In this new millennia, Knowledge is King! Let me share something as innocent as a poor design of a lottery machine. The images below came from one of my own adverse experiences recently with a new California Lotto vending machine. I had come to avoid trying to play my own lottery numbers on this machine after several frustrating encounters with it in my area grocery store. Then one evening, I was in a time crunch and thought I’d take another stab at it. But it whacked me upside my head again (figuratively). So I took photos of it and ran a user analysis of its design and display panel. My on-screen notes below are my conclusions. Note that this new machine also has a handicap accessible placard on it. Next, I compared it to its previous model. And below the photos, you will read what I concluded. Here’s a close up of the vending machine’s operating panel. As to my theory on what went wrong in this newer design lottery vending machine bearing the handicap placard, I think it was designed by an individual in a “wheelchair,” because that is the only way a user would know when their ticket has printed (amidst all of its idiotic & disconnected steps). It is only through a low field of view that a user would know when their ticket printed. Anyone taller than say 4’6″ standing with three feet of the machine would never see the ticket deep in the tray – unless they could recall from a prior experience. You’d just keep trying fixes to make it print! This design renders this machine even a more horrible design for users with cognitive challenges. What do I know about usability, cognitive accessibility, and human factors engineering? From 1975 to 1992 I worked with (and was an expert) the most archaic poorly designed nuclear medical instruments. With my own company, Certified Nuclear Imaging, I worked in order 60 hospitals and imaging centers. Then in 1992, I suffered a head injury in an auto accident, and developed post traumatic hydrocephalus, ending up with 12 brain shunt operations today and 500-1000 shunt malfunctions over 25 years. But, if you count my sensory processing disorder (SPD) cognitive challenges from exposure to loud noise and multi-media that is everywhere around us, I’ve faced thousands of challenging cognitive situations over 25 years. One can get pretty innovative when you’re forced to live in a “virtual reality” world because of poor memory. So I came to design many different types of cognitive aides, and today am critical of the large numbers of inadequate web & app panels, user instructions, and the like. My challenges led me in 1997 to design & patent a diagnostic monitoring app for CNS shunts used in the treatment of hydrocephalus to run on a PDA. And a DiaCeph Test screenshot from about 2001 taken from a Power Point presentation. My DiaCeph Test running on a PDA would have been one of the earliest mobile apps, for which I was labeled a “pioneer.” Unfortunately, money for start-ups like DiaCeph Inc. were hard to come by back then. But it led me into designing all kinds of assistive “cognitive” aids, solutions, researching cognition, and eventually usability – the precursor to today’s tech & user usable designs. For several years, I was in regular conduct with staff at Hewlett Packard as they had acquired Compaq and then were the top seller of PDAs, and scientists at the Coleman Institute in Colorado and others around the country. Unfortunately, they were focused on technology solutions for lower functioning individuals, and that just didn’t interest me. However, today we are able to merge this knowledge on human factors and usability. My goal with my DiaCeph Test was to get patients with hydrocephalus to be able to operate the app by themselves – a huge challenge. So I continually played around with different design concepts. I never went back to school during all of this. But by 1999, I was being introduced as a “neuroscientist.” In 2003, when I couldn’t make a go of my DiaCeph Test, I made it available as paper forms & instructions, then got involved in music & drumming therapy, or “drum circles,” where I poured the next 10 years of my life into. I’ve had many many amazing experiences and discoveries with drumming, like my popular blog on the Brain Science of Basketball. I’ll save this for another day. But I’ll share that being a drum circle facilitator teaches one a great deal about cognition and human behavior. In 2011 or so, I created a Cognitive Neuroscience page on my main web site, which features many of my efforts in the neurosciences. However, it does not contain or index the many blogs I’ve written here (as my blogs are more recent). Feel free to scroll thru some of my published web pages and articles. Let me share one more example of where poor usability crossed over into cognitive accessibility, this time in the Norton Security 2017 Deluxe renewal packet that I purchased from the Norton store on Amazon.com. Their 2017 renewal product came with the instructions for a new installation, which created 2-3 hours of frustration from incorrect install steps, that required a online support and a phone call to fix. Incorrect Installation Instructions for Norton Security 2017 Deluxe Renewal hurt its Usability and posed unnecessary Challenges with Cognitive Accessibility. I’ve also had my cognitive and usability challenges with Amazon.com. However, here’s a nice screenshot I’d like to share on the usability of the “contact us” options at Ebay. This type panel and confusing OPTIONS is still the standard in so many large online retailers today. And one of my favorite web accessibility panels we will someday see for TV programming, is Time Warner Cable‘s internet telephone panel for blocking telemarketers, that I predict someday and have added in graphic functionality the ability to block “unwanted loud TV commercials.” Hurrah! Time Warner Cable’s Internet Telephone Web Panel for screening Telemarketing Calls may someday allow users to screen Loud TV Commercials. And additional positive and futuristic usability is in my very popular blog on use of the eWeather HD App to manage migraines and headaches. Though I didn’t design the app, the migraine management application came out of my mHealth experiences with the DiaCeph Test for hydrocephalus. I have painstakingly done as much as I could the enable this weather app to be used as an mHealth app. And finally, my blog on my DiaCeph Test as a mobile app. It was in 2013 amid so much frustration with tech and multimedia, that I researched and purchased the domain CognitiveAccessibility.org. Regrettably, I am yet to publish its own. It points to a “page” of that title on my main web site. In 2017, I still do all of my own web site publishing, tech, and social media work. And because of all this, I just haven’t found the time to make its own site. I already have 3 web sites, so this would involve publishing and managing a 4th. I haven’t really updated this page since 2013. But I think you’ll get the jist of what I’m trying to do. I believe the time is now to publish its own site, as usability has now crossed the threshold into cognitive accessibility. Tomorrow is now today! What does the term, “Cognitive Accessibility” actually mean? Well, it means exactly as it sounds. It is defined as “reasonable” intellectual access to public places, things, and technology for persons with “cognitive” or “intellectual” disabilities, and from any number of etiologies (brain injury, learning disabilities, PTSD, developmental, aging). Access means that the provider must undertake a reasonable amount of consideration & design preparation so persons with cognitive affected disabilities may understand and use the products. The prevailing law in this area comes under both the Americans with Disabilities Act, and Section 508 of the Rehab Act, but more in the latter, which holds specificity in access to web sites and somewhat in product user instructions. 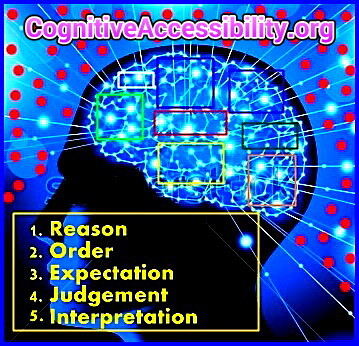 Cognitive Accessible Designs would then be appropriate useful designs of web sites, product labeling, and instructions on products and premises that can reasonably be understood by persons with cognitive disabilities. The reason you haven’t that much about this thru the years is that up until more recently, it was difficult to ascertain what “reasonable & appropriate” designs were as the affected persons had such a broad spectrum of disability and aptitude. So designers didn’t know who & what level they were designing for. But, over the last 10 years, several things have changed. First, affected persons are more able to get out and about today thru revisions in social policy, educational, and work programs. Second, we have many in the military who have returned from combat with a spectrum of post TBI & post concussion disorders, and now we have far more awareness of it – as well as new research has become available. Thirdly, we have advances in, and much more availability of, cognitive aids, PDAs, mobile smart phones, etc. today, where many more people are using them, and this high usage is rapidly redefining cognitive accessibility parameters, where cognitive accessible designs are scrambling to keep up. Fourth, we have a significant age related “digital divide,” age 50-55 today, which is raising more and more challenges to our aging population, many of which are still computer illiterate. The tech industry resultingly left these 50M Americans out of consideration in their cognitive accessible designs. And now today, there is ever increasing on these Americans to learn to use tech. And fifth, lest not leave out the rising prevalence of dementias in our aging population. They have considerable cognitive disabilities, and their needs are yet to be met. All said, there are a lot of Americans today with cognitive disorders. Most are out and about. Instructional designs have not kept up. And now we have a cognitive accessibility crisis! I hope to get my CognitiveAccessibility.org site online soon. In the meantime, please visit our cognitive accessibility web page on our main web site: http://www.dollecommunications.com/cognitive_accessibility.htm One key emerging challenge lies in the cognitive accessibility of popular internet web sites like Google, Facebook, iTunes, and LinkedIn. Over the last few months, each of these sites have undergone a major update & redesign of their UI, or user interface. Each time a UI is changed, there is a new learning curve for the user. And where users have any medical condition, injury, or aging issue that limits the comprehension of the changes and architecture and subsequent use of the web site, we have a problem. And the problem(s) lie both in accessibility (cognitive), which are protected by disability law, and loss of productivity, which should be of major concern to employers & persons having to use such sites as part of their school or work. In addition to cognitive accessibility and cognitive accessible designs, most web sites today still pose accessibility challenges due to the “digital divide,” that is, the educational exposure to technology by persons over the age of about 50 today. Such persons and internet users, not having grown up with or been schooled in technology, often find the Internet, tech, and mobile apps a significant challenge. And with so many of these being baby-boomers who have never fully adopted (if at all) the internet & tech boom of the last 15 years, web site and tech providers have a growing challenge. Now, add in the growing challenges of so many items on store shelves today, and the continual rearranging of products on store shelves, and stores and their products and packaging pose additional challenges in Cognitive Accessible Designs. Take Target, for instance, who own 1700 stores nationwide. On average they rotate, introduce, relocate, or change the products on their store shelves several times per month. And after each change, customers have to re-familiarize themselves with location, product label, and missing/changed items. It presents ever-changing cognitive and visual challenges to shoppers. And if Target and other department stores, and product manufacturers, do not give ample attention to Cognitive Accessible Designs, you end up with a lot of confusion in stores, with lots of returns due to wrong items purchased. These experiences and added time/store visits then lower both accessibility and productivity. The poor Cognitive Accessibility of the Colgate Toothpaste section at this Target store in Fountain Valley, CA, will make anyone’s head spin. Can you imagine how many man-hours across the U.S. in Target stores alone are at stake due to additional shopping time and lost customer & staff productivity in maintaining these shelves, and handling the many customer returns? The figure must be staggering. Yet, the trend in poor Cognitive Accessible Designs continues. You’d think companies would want to get this right, to spend a little more time & money when they create these display designs. But these are largely new issues for most of us in the U.S. because of our mobile population, aging baby-boomers, and millions of Americans today with learning disabilities, autism, post brain injury, neurological disorders, and the like. We must address this. This is a matter of national productivity, and disability rights & accommodations! 1. When U.S. companies update their UIs and web sites, they should provide new instructions similar to that provided in “boxed” instructions, i.e. User instructions, A 1-page diagram of the site UI and architecture, and precautions & warnings for privacy & user settings. 2. Internet sites should adopt “UI standards” for display & site architecture as to how to set user privacy & notifications. Statistical data on affected internet users with brain and learning disorders requiring “Cognitive Accessible Designs” and protections under the American’s with Disabilities Act and Section 508 of the Rehab Act are considerable. As web pages and web sites add more and more content and graphics, it makes the requisite design implications for cognitive accessible designs more and more critical. Recent updates and redesign of UIs including Apple, Norton, and LinkedIn, came without any notice or information that might have lessened the challenge for affected users needing to learn to use the updated UIs. More than just issues with cognitive accessibility, Cognitive Accessible Designs also raise broad issues in Productivity and in the best use of our time. Clearly, as much as tech, web sites, smart phones, and super stores aid us in productivity, they’re resulting in our spending a huge amount of time trying to make them operational. Cognitive Accessible Designs will become an increasing public & educational challenge for the U.S. in the years ahead. We’d be wise to commit sufficient resources to get this right. I’ll continue this update this 2013 blog and hope to get a site up soon at CognitiveAccessibility.org. ABOUT ME: I suffered a brain injury in 1992 w/ 12 brain shunt operations to date. Background in medical technology, the neurosciences, music & drumming therapy, and considerable insight into technology, AI use of technology, and cognitive accessibility. Work part time as a neuroscientist in music & drumming therapy, medical software/apps monitoring, and the neurosciences. Cognitive accessibility is not only a matter of importance to persons with brain injury and cognitive disorders, it is critical to optimal access and everyday use of products & services by ordinary Americans. Cognitive accessibility speaks wider to productivity and lost time & opportunities. It is of national significance! In persons with cognitive special needs, it poses a DUAL threat by complicating everyday access to critical goods & services necessary for independent living, AND it handicaps users who have come to rely on cognitive aids & technology for independent living. These cognitive aids, mobile apps & such are our wheelchairs, visual, and speech aids. But no many remain unreliable today, with requisite support on these accessibility fixes nearly non-existent. Today, I spoke with a manager at an area Target store regarding making improvements in their store shelf designs & display, and I was pleased. He was very receptive. I shared how cognitive accessible designs are not just an issue of importance in brain & cognitive dysfunction. Rather, they speak to the wider challenges posed by Americans living longer, being more mobile, independent, and the demands for productivity in all facets of our lives today. I am encouraged. I had been in contact with the Coleman Institute, Hewlett Packard, and others in the state of Colorado regarding assistive cognitive technologies back as early as 2002. I had wanted to create a new class of mobile phones for persons with cognitive dysfunction. At that time, I felt there was too much emphasis on accommodations for persons with low level function, and it lacked broader appeal. Today, there’s more interest in the neurosciences, brain injury, and cognition, and this cognitive accessibility – esp with our aging population and the prevalence of dementias and Alzheimer’s Disease.